There is a brand new art gallery in Marshall. The DENOART Gallery is a permanent one-man show featuring the artwork of Dennis O’Bryant, who lives in a century-old Victorian bungalow just east of the downtown historic district at 707 East Burleson Street. O’Bryant wrote a poem to explain why he decided to open his home and studio as a private, personal gallery to showcase his art. As a painter, O’Bryant chooses to work in a variety of styles ranging from traditional to linear and abstract constructions. The paintings are usually done in acrylic paint, and they often include the use of Sharpie permanent markers or the addition of paper collage and other mixed media items. He also makes sculptural pieces in fabricated metal and clay. He is a collage and mixed media artist, photographer, and poet. Sculpted works are usually made in metal. They are abstract pieces composed of geometric and twisted pieces of steel. His clay pieces, however, usually have more of a human element, which includes stylized female torsos and faces as well as full figures and heads. His first artistic success after leaving the corporate world was with a series of paintings of dark and mysterious Caddo Lake. 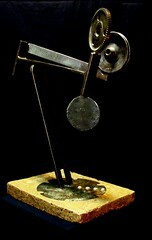 After the Caddo Lake series, he did a series of abstract paintings, and then he began making abstract metal sculptures. He also creates Raku pottery – and then there’s his poetry. He prefers to create pieces that tell a story. Mostly it is the story about his own journey. He someday plans to build a larger studio in the backyard close to his storage building, which he built to echo the form of the house. The existing studio area of the house is filled with works in progress. A narrow staircase leads to the attic. “There’s another whole house up there!” he laughed. He explained that if it were possible to open the attic with flooring and lighting he would double the size of his small house. O’Bryant explained how DENOART, the name he uses for publicity, publications and now his gallery, came to be. It originated at a time when he was working in corporate America. The company for which he worked identified employees by combining the first three letters of their first names and the first letter of their second names. People began calling each other by that combination. He became DENO. The name stuck with him, and when he left that position he decided to combine it with what he was doing. 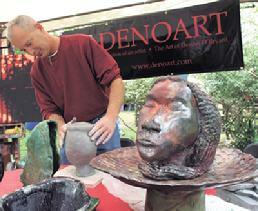 Now that DENO was creating art, he found that he enjoyed the name DENOART. O’Bryant’s gallery is his home, and his home is now his gallery. It contains his studio sketchbooks, displays of his work and his finished art. “This way it is My house, My art, MY gallery!” he said. “And I am answerable to no one about what I exhibit or how I exhibit it or how it should look or what I want to do. Artists want people to look at their art. Sometimes people think something strange when you say, ‘Come by and look at my art.’ You will get this strange stare and the Heisman Trophy stiff arm and they will say, ‘I’m not going to buy anything now.’ Of course the art is for sale, but no artist is going to force it on you. It’s not like I’m selling used cars or furniture. This is my experience. This is my art. This is my life. This is my home, and this is the dining room, and it is the main gallery, and it is also a place to live. While many people would find it uncomfortable to think about inviting strangers into their homes to see and perhaps buy their work, O’Bryant insisted that he has already had experience with people taking a tour of his home. One year, he opened his house for a Christmas Home Tour during Marshall’s Wonderland of Lights festival. Since O’Bryant admits that his hands are always busy creating art in one form or another, he plans to create a mosaic sculpture during the hours he is keeping the house/gallery open. He has already selected clay and ceramic materials and has secured a large base for the project. He intends to begin the sculpture as soon as he opens the doors to the gallery. “I’m setting some hours when I will be here,” he said. He plans to close during the heat of summer and will reopen in the fall. Gallery hours will continue from April to the end of July. They will be Thursday and Friday afternoons from 3 p.m. to 6 p.m. in the afternoon, or by appointment. When it’s freezing cold in the winter or blistering hot in the summer, I’ll be closed. But that’s okay because nobody will want to come out in that kind of weather anyhow … and if they do, they can call and we’ll arrange something. DENOART Gallery will open beginning on Thursday, April 3 and will be open every Thursday and Friday through July 25, 26, and 27, with an open house/studio/gallery scheduled for that summer weekend. For further information or to schedule a visit, contact Dennis O’Bryant at www.de noart.com, check his page on Facebook, or call him at 903-503-3675.
the house that serves as his residence, studio and gallery. bills, as he has since he was 15 years old. rods and squares. Other elements of obvious industrial origin feature a series of uniform round openings. All are rather substantial in size and similar in shape. There are nuts or bolts or other small bits here. movement, perhaps even of purpose, as though they were merely pausing before going about their business. O'Bryant describes his images as a cross between the styles of Paul Gaugain, a French impressionist and Andy Warhol, an American pop artist. Evolution of Art - Local artist's work fills last minute void at Marshall Visual Art Center. O'Bryant said, explaining he keeps inventory of his work on the advice of well known painter and friend, the late Clyde Connell. "So that's a critical element." Dennis O'Bryant, featured artist at this year's Spring Arts Festival, sculpts a clay bust Saturday morning to the delight of onlookers. O'Bryant's display featured several "raku" clay pieces, which means the artist used an ancient process to fire the works of art. O'Bryant's work is currently on exhibit at Easley's Fine Art on Main Street. The show will continue throughout the month of May. Despite its small town size, Marshall offers big time opportunities for artists and those who admire their works, says Lou Violette. Dennis O'Bryant agrees in part. He recently was a featured artist at the Cultural Crossroads Spring Arts Festival in Minden, LA., and the not-for-profit arts agency purchased his steel sculpture entitled, Let Go. A graphic artist by trade, O'Bryant has produced paintings, clay and steel pieces. "We have an excellent art community," O'Bryant said of local talent. "And I think our neighboring cities are a tad bit envious that we have facilities like the Marshall Visual Art Center and the Michelson Museum next door to each other in the downtown corridor. Susan Spears does a good job at the Michelson and Brooks Little has done an equally good job at the center. "I'm glad I have my home base here. I think it's going to be up to the tourism promotion group to suggest ways to bring in more out of town patrons. Of course, we would want outside recognition. We want people to come here because we need their support." 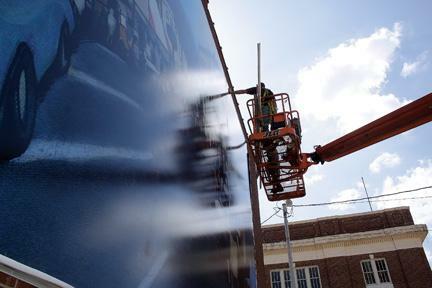 Given the community's economic composition, O'Bryant said it is to be expected that there is not a "high focus" on art, but he added: "We do pretty good. Sure, it could be better, but it could be worse too." O'Bryant's steel sculptures may be seen in the yard of his home and studio at 707 E. Burleson St. and photographs of his artistic endeavors may be viewed on his Web site, http://www.denoart.com/. With water-loving cypress trees bearing long sleeves of sleepy Spanish moss, sleek white egrets and startling sunsets, Caddo Lake's obvious charms call out to the souls of artists both near and far. The Marshall Visual Art Center, 208 E. Burleson St., is hosting a show featuring Caddo Lake images in paint, mixed media and pottery through April 16 by artists enchanted with the lakes mysteries and its simple but unique nature. "The artists are from the region, and we are holding it in part to bring focus to the beauty of Caddo Lake and the sensitivity of the ecosystems and environment there," said Brooks Little, director. Included in the local artist lineup are Kay Clement, Doug Heard, Christian Seidler, JoAnne Imhof, Robert Harris, Sally Martin, Christine Chandler and Dennis O'Bryant. Ms. Martin's watercolor and mixed media pieces depict a magical Caddo Lake with happy water lilies. "It's my ocean," she said. "Wherever I have lived, whatever body of water I live near is my ocean. The cypress knees and moss that hangs down depicts mystery." Ms. Chandler feels she is in good company at the MVAC show for the beloved lake. She has pieces inspired by rain on the lake, its different moods and perspectives. "You wouldn't think there would be so many looks, but everybody sees it differently. Everyone has a different take on it," said Ms. Chandler. "I think everything in this exhibit is fantastic and so different." A reception will not be held in conjunction with this collection. For more information on show or Marshall Visual Art Center activities, call 903-938-9860.
the Longview Museum of Fine Arts on Sat, July 10, 7 - 9 pm, says Dennis O'Bryant. O'Bryant, a former Shreveporter who has been based in Marshall, Tx, for some years, says nine artists from the East Texas area are part of the exhibit at the Longview Museum. "The LMFA is one of the best Contemporary Art Museums this side of Dallas and I am pretty excited to be showing with a couple of my best artist friends from Marshall, Erin Lambers & Curtis Graff," says the sculptor-painter-photographer. Art may be visual, a feast for the eyes, but often there is a deeper story on display. The Longview Museum of Fine Arts opened its newest exhibition, "Spiritual Undertones - The Angels Among Us," on July 10. 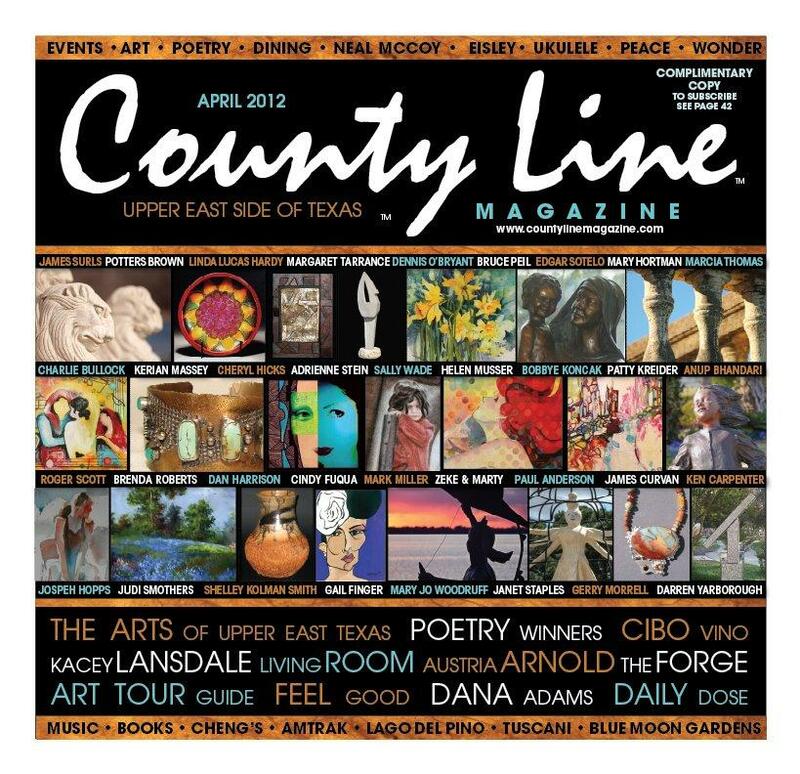 The exhibit features nine East Texas artists and their work. Marshall was well-represented by Dennis O'Bryant's metal sculpture, Erin Lambers' clay squiggle pots and Curtis Graff's mixed media. "Most artists would probably agree they have to reach within themselves to draw out their innermost feelings and desires that shape their work; therefore, each person's individuality appears and influences the outcome of his or her art," stated a press release from the museum. Ms. Lambers is a full-time potter and clay teacher. Her work is displayed in galleries and stores in more than 26 states. Each piece has a part of her in it and so she calls her work "Pottery that Speaks." Her work may be viewed at www.erinspottery.com. O'Bryant is not only a sculptor of metal but creates in clay and paint as well. His subjects include Caddo Lake, the female form and architecture. He has work displayed in private collections and has been featured in local and Shreveport exhibitions. His work may be seen at www.denoart.com. Graff is probably best known locally for homes created by his construction company. However, when not building homes, Graff is an artist at heart, creating mixed media art involving collage and high-gloss finishes. His complex designs integrate geometric shapes, graphic pop-art style and photographic elements. The remaining six artists also included in the exhibition are Larry Kitchens and Coy Lothrop of Kilgore, Thora Poneleit Doucette and Kristen Henton of Longview, Michael Bishop of Gladewater and Bart Souttendijk of Quitman. Their work represents a variety of techniques and styles. The "Spiritual Undertones" exhibition will be on display through Aug. 28 at the Museum of Fine Arts, 215 E. Tyler Street. This is fitting since it was created by local artist Dennis O’Bryant.